Chiclana de la Frontera is a town in southwestern Spain, in the province of Cadiz, near the Gulf of Cadiz. The area is a fertile region, with much agriculture, including vineyards. It is about 5 miles north of the battlefield of the Battle of Barrosa where Sir Thomas Graham (Lord Lynedoch) defeated the French under Marshal Victor, on 5 March 1811. 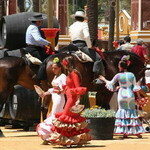 During the last ten years Chiclana emerged as an important touristic and natural resort. Part of the town's area is occupied by the 'Cádiz Bay' Natural Park and we find different ecosystems like countryside, pinewoods, marsh and beaches. At about 4 miles from the town center there is Novo Sancti Petri, the touristic resort with a high quality range of hotels and facilities. 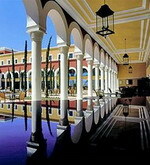 The Melia Sancti Petri is a grand hotel inspired by Moorish architecture, with its own private 18-hole golf course. 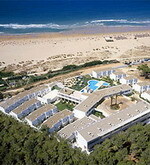 It is located on the Playa Barrosa beach on the Atlantic Costa de la Luz, eight kilometres from Chiclana de la Frontera. The hotel offers three dining options: Restaurante El Patio serves a buffet in colourful, Moorish surroundings, featuring arches, greenery and a soothing fountain; Restaurante San Marco serves Mediterranean and local cuisine from an à la carte menu. With large windows overlooking the pool and gardens, the formal Restaurante Alhambra has a choice of international cuisine. 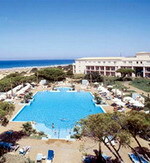 Sol Sancti Petri is located in Chiclana, Spain, 150 metres from Barrosa Beach, and 30 kilometres from Cadiz. San Fernando Station is 15 kilometres away. This hotel has an outdoor swimming pool as well as a gift shop, concierge desk, and laundry facilities. A safe-deposit box is available at the 24-hour front desk, and a parking garage is located nearby. Sol Sancti Petri has a restaurant, café, bar, and lounge. Apartments have air conditioning, include kitchens, and extend to balconies. All are equipped with internet access, satellite television, direct-dial phones, safes, and hair dryers. 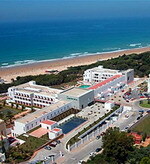 The Valentin Sancti Petri Hotel Spa and Convention Centre is located in Chiclana de la Frontera, Spain, on the Costa De La Luz, 40 kilometres from Cadiz city centre, and 55 kilometres from Jerez De La Frontera. Built in an Andalusian colonial style, the Valentin Sancti Petri Hotel features five swimming pools; two outdoor, two indoor, and a separate children's pool. The hotel's health spa offers an extensive range of beauty and therapeutic treatments. Other services include concierge, laundry and dry cleaning facilities, and a 24-hour front desk. Conil de la Frontera is a town on the Atlantic coast in the southern part of Spain, with around 19,000 inhabitants. The town has six beaches: Playa La Fontanilla, Playa El Roqueo (with a 1936 Civil War bunker), Playa Fuente del Gallo, Playa Punta Lejos, Playa Cala del Aceite and Playa los Bateles. 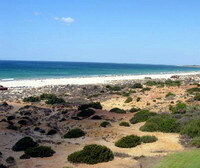 Playa los Bateles is the longest and the most popular in the summer. Conil de la Frontera is primarily a vacation town and the most of the tourists are Spanish although you often also hear German in town. Built around a pool and set in tropical gardens, the Conil Park is a modern white hotel which looks straight out to the Atlantic Ocean, 150 metres from the beach. Guests can enjoy international and regional buffet dishes in the main restaurant and in summer the poolside bar serves snacks and refreshments during the day. Guests can take a short stroll down to the beach or lounge poolside on the sun terraces, while children play in the kids' pool. Sun loungers are also available at the beach for guests' use. Rooms are equipped with air conditioning, satellite television, telephones, safes and hair dryers; the family bungalows have two bedrooms with two bathrooms, a living area and a kitchenette. The Hotel Garbi Costa Luz is a cliff-front hotel with access to the beach 100 metres away, 800 metres from Conil village centre and 39 kilometres from Cadiz. Guests can swim in the outdoor pool and relax with a drink from the poolside bar, or stroll through the hotel's gardens. The restaurant offers a buffet of international and Mediterranean dishes, with daily specialities. Families with children will benefit from a kids' pool, television room and billiards. The tourist resort of Conil de la Frontera has a number of beaches offering water sports, especially Roche Beach, which features large waves ideal for surfing. Built and maintained in Andalusian-style with eco- friendly materials, this family orientated hotel is located on the doorstep of a Spanish fishing village. A children's club organises daily activities from May through to October. Adults, meanwhile, can sign up to the crafts club, or spend their time in the health spa, where a hydrotherapy swimming pool shares space with a terrace of individual massage cabins, a sauna, turkish bath, ice shower, jetted tub, seaweed bath and beauty treatment zone. Sun loungers are dotted around the 8,500 square metres of subtropical garden of reforested local plants. Here, guests also find two outdoor swimming pools, alongside which an open-air grill house provides evening meals. This beautiful 4 star hotel is located near the "Chapín" football stadium in front of the Conference Centre and very close to the centre of the city, and the City Fair. You will be surprised by the lightness of its rooms, halls and common areas. It is a unique AC Hotel. Modern and avant-garde, the Hotel AC Jerez adapts its selection for every moment of the day. In the morning, it serves up a complete buffet breakfast of first-rate products. When you enter your room, you will feel like you have entered into a place deigned to help you rest, like the four pillows on your bed. 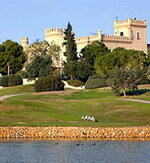 The Montecastillo Resort is comprised of a four-floor hotel with 20 adjacent villas set in castle grounds with an 18-hole golf course, and is located nine kilometres from Jerez. Guests can take a refreshing dip in one of two outdoor pools, open during July and August, or head for the spa where there is an indoor pool, dry and steam saunas, hot tub, solarium and massage and beauty treatment rooms. The castle adjacent to the hotel is home to the Golf Clubhouse as well as 14 conference rooms with capacity for up to 300 people. The 208 Andalusian-style guestrooms come equipped with air conditioning, satellite television, safes and minibars, while villa accommodation also has kitchenettes with small cookers. The Hotel Guadalete is a modern three-floor hotel situated 36 kilometres northeast of Cadiz in the town of Jerez de la Frontera, which is renowned in Andalusia for its sherry, horse shows and flamenco. Guests can soak up the sun by the swimming pool or relax in the contemporary lounge and browse the daily newspapers. Later, guests can order cocktails from the bar and then enjoy the barbecues organised by the hotel. Alternatively, guests can sample regional Spanish dishes in the Restaurant la Cartuja or try the tapas dishes at the Bar del Guadalete. The 137 air-conditioned guestrooms have colourful contemporary decor with painted wood furniture. 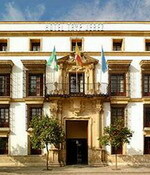 The Hotel Jerez is a modern Andalusian hotel set in a quiet area, just 100 metres from the Congress Centre and two kilometres from the town centre. The hotel offers a number of dining options: El Cartujano serves a range of international and traditional Andalusian dishes in an elegant, modern setting with a poolside terrace; El Catavino offers Spanish tapas, salads and sandwiches in a traditional setting with a terrace area and live music, and the Patios de los Naranjos is an outdoor barbecue serving grilled meat and fish. Guests can work up a sweat on the tennis courts and in the fully equipped fitness room, go for a refreshing dip in the indoor and outdoor pools, and relax in the sauna, jetted tub and steam room. 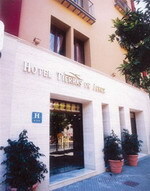 The Hotel Tierras de Jerez was inaugurated in May 2002; it is situated in the Plaza de las Angustias, an important area within the historic center of Jerez de la Frontera; it is surrounded by emblematic monuments namely the Alcázar (Castle) and the Cathedral. 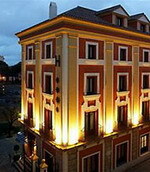 The hotel is situated in the most exclusive area of the city with its commerce and fine restaurants and near to tourist sights such as the museums and 'bodegas' (vine cellars). The Hotel has 50 rooms (1 double with extra room, 5 double rooms with master-bed, 32 double rooms with separated beds and 12 single rooms). The Hotel Tryp Jerez is located in the centre of Jerez de la Frontera, Andalucia, Southern Spain, 300 metres from the mystery of Jerez Museum and 1 kilometre from the Archaeological Museum. 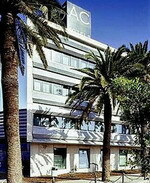 Hotel Tryp Jerez offers wireless internet access in the air-conditioned public areas. Room service is available and there is a parking garage. The front desk is open 24 hours a day. The Cafeteria La Goyesca at Hotel Tryp Jerez offers snacks and drinks. refreshments are served in the lounge bar. All 98 guestrooms are air-conditioned and have satellite television, safes, minibars, and internet access. Bathrooms have hair dryers.